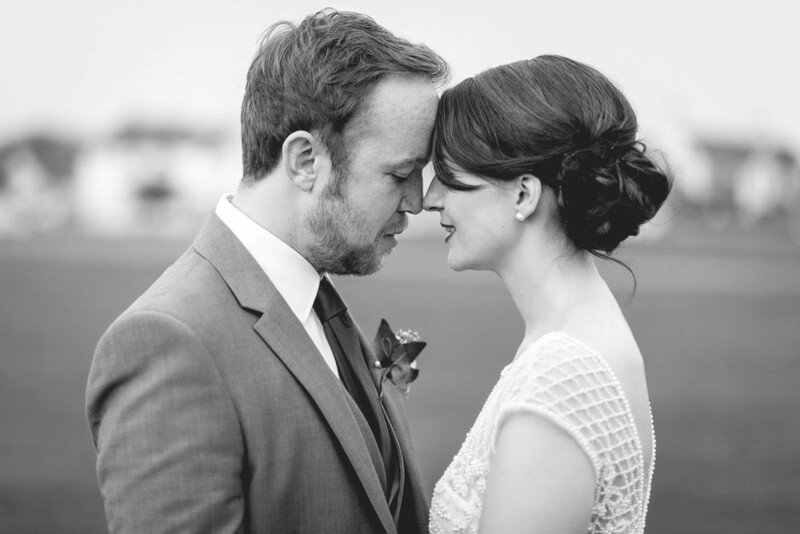 Weddings like this should come with a warning of ‘G’ for utterly gorgeous. 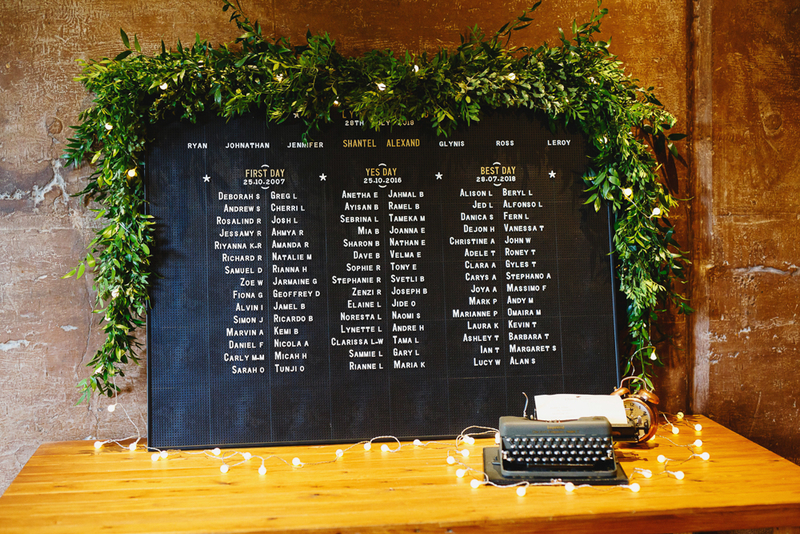 Not only are our newlyweds absolutely stunning, but also every aesthetic detail of their day is divine: from the venue to the flowers to the semi-naked wedding cake to the peg board table plan. Shall I go on swooning? This celebration is filled with emotion and happiness – and if it doesn’t have you reaching for a hanky it will definitely have you drooling over the sweet bar. Mm mmm! Move over marquee there is a new bad boy in town. Katie and Rich had a stretch tent in Katie’s parents’ back garden and I think it looks stunning! They put some work in to that garden and it is amaing. They created some sort of mini garden in the middle of the tent and it is just, well, see for yourself… The perfect place for a table for two. And I looooove the centrepieces. So original and… different. “…fill a venue with pretty things that you love you will have a beautiful wedding.” I think Katie has hit the nail on the head. And boy did she do just that. She also has some very sound advice for those of you who are having to source a lot of your own suppliers. And it was all sumptuously captured by the talented Kirsten Mavric. Oh, and there’s a very cute dog involved. 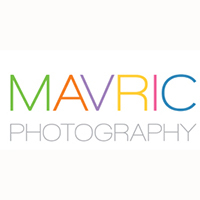 We are really pleased to welcome Mavric Photography to The Love Lust List. The Rock My Wedding directory with a difference. 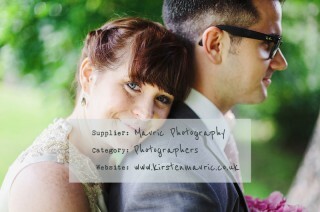 You can find Mavric Photography in our Central London Photographers category. Check Mavric Photography out and remember if you are looking for vendors and suppliers with the RMW seal of approval, the Love Lust List is only one click away via the ‘Find A Supplier’ tab in the header section. I’m Kirsten, a London based wedding photographer and my aim is to capture your wedding in a bright, colourful and elegant documentary style. There are many moments you’ll miss at your wedding, and it’s my job to capture them for you, and for those images to stand the test of time. It looks like Monday is becomming destination wedding day here at Rock My Wedding. Last week we brought you a wedding that took place in Sierra Leone and today we are visiting Round the Bend Lodge, Breede River. Two hours from Cape Town in South Africa. 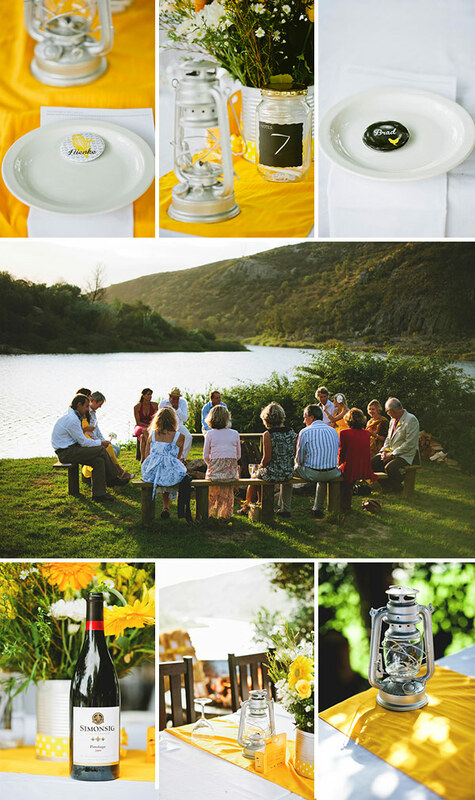 The venue lies on the banks of the Breede River, in the South African country side, surrounded by farm lands – a setting that led Matt and Gill to decide upon a Country Chic theme for their wedding. All of the stunning photography today is by Mavric Photography. I like to believe I know my shape better than anyone, and what makes me self-conscious is not necessarily what a designer would consider an unattractive feature, but it is MY little insecurity. I also had to consider my budget and how much I wanted to spend on a dress I would only wear once, so I had a look at all the clothing pieces in my cupboard that make me feel good about myself and I chose features like cap sleeves to hide my “swimmers arms” and an empire line skirt to disguise my lack of a waist, and I started to look for ideas online. I then worked with a dressmaker, Julie Douglas, to construct a frock. It was important that the dress fit perfectly and that I was comfortable. A very valuable exercise was to make a mock-up of the dress (but in black fabric), which I wore to an event a few months before the wedding. Not everyone will have this luxury, but I learnt so much from the mock-up dress that we changed for the wedding dress. I wore a ring, in which my late grandmother’s rubies were set. Even though it didn’t go with my dress at all, I am glad I wore it. It was comforting. I had a very simple veil and a diamante hair clip, and black Swarovski crystal earrings. I wore black two toned Mary Jane style shoes with a medium heel so that I could navigate the lawn to the altar! My hair stylist, Cindy from TOSCA, made the long drive into the country to help me and my bridesmaids look fantastic! I wore my hair down with a simple braid on the side and minimal make-up, as I still wanted to look like myself. As long as my skin looked healthy and clear, I was happy. The bridesmaids were in identical yellow summer dresses, all of which were made by Julie Douglas, the dressmaker I used for my own dress. Matt wore a dark grey tailored suit (which we decided to invest in), with a yellow tie to match the bridesmaids, and the groomsmen wore black suits with silver ties. All the men wore a single yellow rose on their lapel. After looking at many different photographers’ websites, I chose Kirsten Mavric, because of her unconventional style and eye for clever compositions. I love her dedication to capturing the image as close to perfect as possible, without having to do too much in postproduction. This is the sign of a true professional! She was always around, but practically invisible and the result was that Matt and I got a storyboard representation of the day. We are nothing short of THRILLED! I have always been a water-baby and my passion is open-water swimming. Matt and I decided that we would be much more comfortable if we were true to ourselves, so instead of a first dance, we decided to have a “first swim”! We announced during the cutting of the cake that we would be forgoing the first dance for a dip in the river, and we invited our guests to join us! Matt and I then went and changed into swimming costumes, onto which the words “Just Married” had been printed. 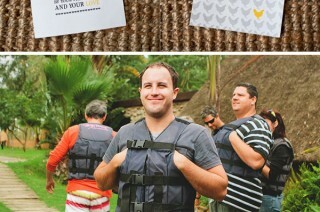 To our surprise, we were joined by more than half of our enthusiastic guests, all geared up to take on the water! On the count of 3, Matt and dashed for the river, followed closely by our guests. The photo opportunity was priceless! The only noteworthy décor pieces were the 2 beautiful, large chandeliers, which we hung from the trees, under which were the reception tables. Keeping with the “Country Chic” theme, we used storm lanterns for lighting and fresh flowers on every table. For each guest I designed a personalised button badge with their name on it, and a “country icon” eg. A chicken, sheep, cowboy hat, cactus, windmill etc. These were placed at the guests table setting, along with an A6 printed card for their ‘message to the couple’. At the centre of the table was a plain glass pickle jar onto which was painted a block of blackboard paint. We wrote the table number on the jar and guests could post their message into this jar. We decided to include disposable cameras on each table for the guests to capture themselves and their dinner-mates. Although there was plenty of wastage, I am happy with the rough charm these candid pictures have. Everyone looks so happy! What made our wedding unique was the introduction of the “Country Chic” theme. We asked all of our guests to dress smart casual with “a touch of the farm”. People then interpreted this in their own way and arrived wearing pretty summer dresses and wellington boots, checkered ribbons at the end of pigtails, large cowboy hats and feathered country fascinators. My advice to future brides-on-a-budget would be not to get wrapped up in expensive traditional décor and flowers, but rather incorporate small creative details like the personalised button badges. Not only did these look cute at the place settings, but were great ice breakers. They also doubled as wedding favours as I saw most of my guests leaving the next day with their badge pinned to their luggage. Chandeliers hanging from trees outside might just be the coolest thing. Ever. And the whole first swim instead of a first dance? Words fail me… In the true spirit of RMW this was Matt and Gill’s day, most certainly their way.